An icon of the Bishops of the First Council of Nicaea with Constantine (in the crown). But if the Nicene Creed is such an abomination, why is so much of it found in D&C 20:17-28? A side-by-side comparison is very surprising. And that he created man, male and female, after his own image and in his own likeness, created he them; And gave unto them commandments that they should love and serve him, the only living and true God, and that he should be the only being whom they should worship. But by the transgression of these holy laws man became sensual and devilish, and became fallen man. Wherefore, the Almighty God gave his Only Begotten Son, as it is written in those scriptures which have been given of him. He suffered temptations but gave no heed unto them. He was crucified, died, and rose again the third day; And ascended into heaven, to sit down on the right hand of the Father, to reign with almighty power according to the will of the Father; That as many as would believe and be baptized in his holy name, and endure in faith to the end, should be saved– And in one Lord Jesus Christ, the only-begotten Son of God. Begotten of his Father before all worlds, God of God, Light of Light, Very God of Very God, Begotten, not made, Being of one substance with the Father, By whom all things were made: Who for us men, and for our salvation he came down from heaven, And was incarnate by the Holy Ghost and the Virgin Mary, And was made man, And was crucified also for us under Pontius Pilate, He suffered, and was buried, And the third day he rose again according to the Scriptures, And ascended into heaven, and sitteth on the right hand of the Father. And he shall come again with glory to judge both the quick and the dead: Whose kingdom shall have no end. And I believe in the Holy Ghost, The Lord and giver of life, Who proceedeth from the Father and the Son, Who with the Father and the Son together is worshipped and glorified, Who spake by the Prophets. Which Father, Son, and Holy Ghost are one God, infinite and eternal, without end. And I believe in one Catholick and Apostolick Church. I acknowledge one Baptism for the remission of sins. And I look for the Resurrection of the dead, And the life of the world to come. (The Nicene Creed is also based almost entirely on scripture, much more so than the Articles of Faith. Almost every phrase is taken word for word from the Bible. All phrases have Biblical supporting scriptures). At first I used the Nicene Creed as used in English by the Roman Catholic Church today. I then realized that the Roman Catholic Church would have been using Latin in 1830, and since we have already seen a strong tie to the Episcopalian Book of Common Prayer for the Sacramental prayers (Rite I), and since this book has been available in the U.S. since 1789, I changed to this version, which (should come as no surprise) is much closer on a word by word basis to D&C 20 than is the modern English Roman Catholic version. I then compared to the even older Book of Common Prayer from the Church of England and found it to be word for word the same as the old Episcopalian version (with different capitalization and punctuation and spelling, e.g. Catholic and Apostolic for Catholick and Apostolick). [It is the Church of England’s Book of Common Prayer that is the source of so much animosity in the early LDS writing. Polemics against a God “without body, parts or passions”, or the emphasis on the Creed of Athanasius are related to this book.] I have used the Church of England Nicene creed above. D&C 20 is obviously related to the Nicene Creed in both word and organization. Joseph Smith used the format of the Nicene Creed in writing D&C section 20 in the same way that I did when I wrote my own statement of faith. I wrote my statement of faith without referring to the Nicene Creed because after saying it so many times and having memorized it is easy to use these familiar phrases, blending them into my own belief statement. I believe Joseph Smith (or whoever actually wrote this part of D&C 20) did not have to refer to this well known Christian creed because it was part of his background. I believe this is also why we find familiar phrases from the “Doxology” in the modern scriptures published by Joseph Smith. These phrases were already a part of his religious “vocabulary”. Why do Christians believe in the deity of Christ today? Is it because they have been forced to do so by legislated theology from councils and popes? No, it is because the Scriptures teach this truth. When orthodox believers affirm the validity of the creed hammered out at Nicea, they are simply affirming a concise, clear presentation of scriptural truth. The authority of the Nicene creed, including its assertion of the homoousion, is not to be found in some concept of an infallible church, but in the fidelity of the creed to scriptural revelation. It speaks with the voice of the apostles because it speaks the truth as they proclaimed it. 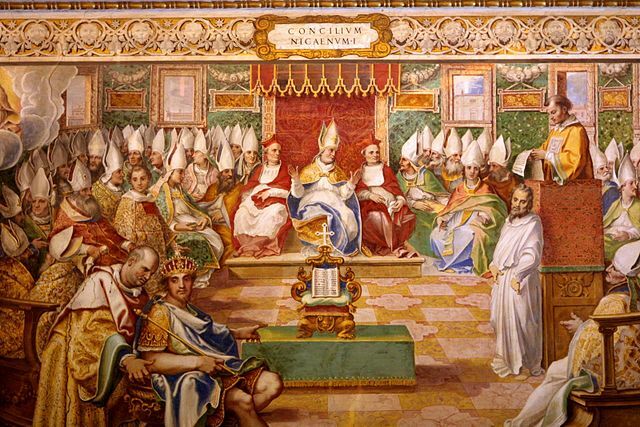 16th Century Fresco in the Sistine Chapel depicting the First Council of Nicea. Is there a reference for Gordon B Hinckley’s statement regarding D&C Section 20 being informed by a ‘creed’? Thank you. That said, nowhere in the article is it asserted that Mr. Hinckley claimed that D&C 20 was informed by a creed – quite the opposite in fact.